I read a recent blog post on “The Happiness Project” about children’s literature and the magical images created by well-written books. When those imaginary scenes are recreated in front of us, in real life, we experience the same sense of happiness that we felt when we first read the story. 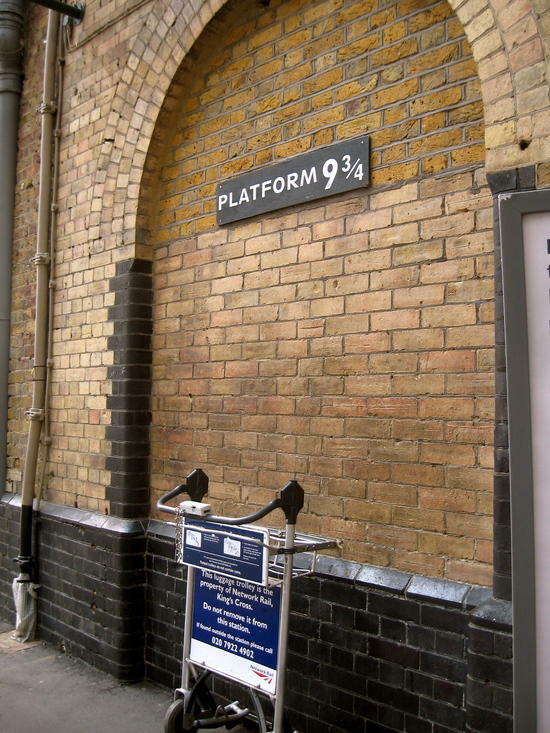 For example, take this real-life art installation at King’s Cross train station in the U.K. I can’t wait until my daughter is old enough to read some of my favorite young reader novels that I enjoyed as a child (The Secret Garden, The Dark is Rising series, James and the Giant Peach, among others.) It will be my excuse to jump right back into the wonderful world created in these stories. When a child is enthralled by a story, they learn to map complex language onto their thoughts. The character descriptions and dialogue expand their communicative world. Many of these stories are filled with abstract language, with figurative language forms like metaphors and similes, idioms, and multiple meaning words. If you are reading to your child, you can choose a book that is several grades more advanced than what they can read on their own. Try stopping periodically to discuss the plot and new words they may not know. The middle school students I work with love the Twilight series, and many adult friends of mine have also gotten hooked on the book. Another favorite is the mystical animal world in the Redwall series complete with characters similar to my childhood favorite Mrs. Frisby and The Rats of Nimh. And I am excited that my daughter will get to add Harry Potter to her list of childhood books. So rediscover those childhood books you loved. Someday soon I will post about writing development, another area very near and dear to my heart. Who knows, maybe one of your kids will be writing those young reader novels someday, creating magical worlds full of adventure and wonder.